When interior designer Ana Donohue first encountered this Mashpee home, the look hadn’t been updated in decades. “It was really early 1980s — and none of the good stuff from the 1980s,” she recalls. The homeowner looked to Donohue to give the Cape Cod-style house an updated, contemporary aesthetic. “It’s a summer home, but I didn’t want to do the standard blue and white scheme,” says Donohue, who paired calming rustic elements with modern features. A Juliet balcony in the great room was removed along with several skylights. The angled ceiling is now accented with coffers inset with bead board panels to create a striking focal point. “We took an eyesore and made it really attractive,” says Donohue. New oak floors are stained the color of sand. “They look really beachy. Grandkids are always tracking in dirt and sand and you can hardly see it because of the color of the floor,” says Donohue. Walls are also painted in hues that echo the colors of sand. 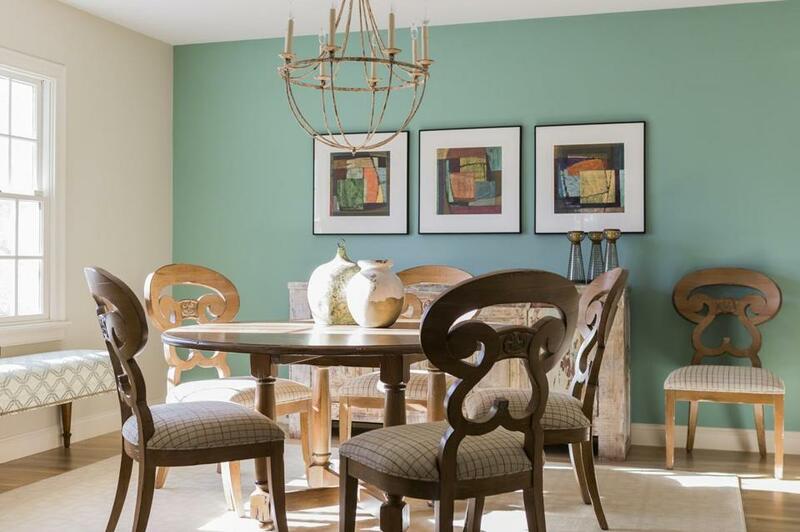 While the overall color palette is rather reserved, pops of the homeowner’s favorite color — a hue reminiscent of sea foam green that Donohue calls “Cape Cod Green” — was infused in a few places to add a bit of flair. Chandeliers are another key element: fixtures add texture and intrigue while providing essential illumination after the sun goes down. One wall is painted green to draw the eye into the room, which is right off the front entry. 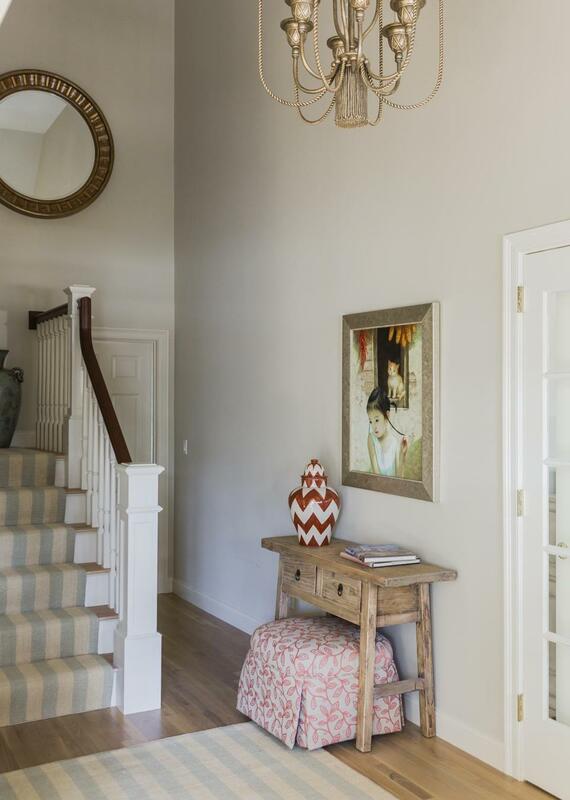 The rounded whitewash chandelier is a custom Lee Jofa design. “The homeowner wanted a table that could accommodate a lot of people, while also serving as a comfortable place for her to enjoy a cup of coffee on her own,” says Donohue, who selected a round medium walnut table with a casual feel. An iron and wood chandelier is a big statement piece that draws the eye up to the appealing ceiling. Drapes are fashioned out of blue, tan, and brown polka dot Lee Jofa fabric that brings whimsy to the space. “I like using polka dots in a beach home,” says Donohue. “It gives a real playfulness to the space. 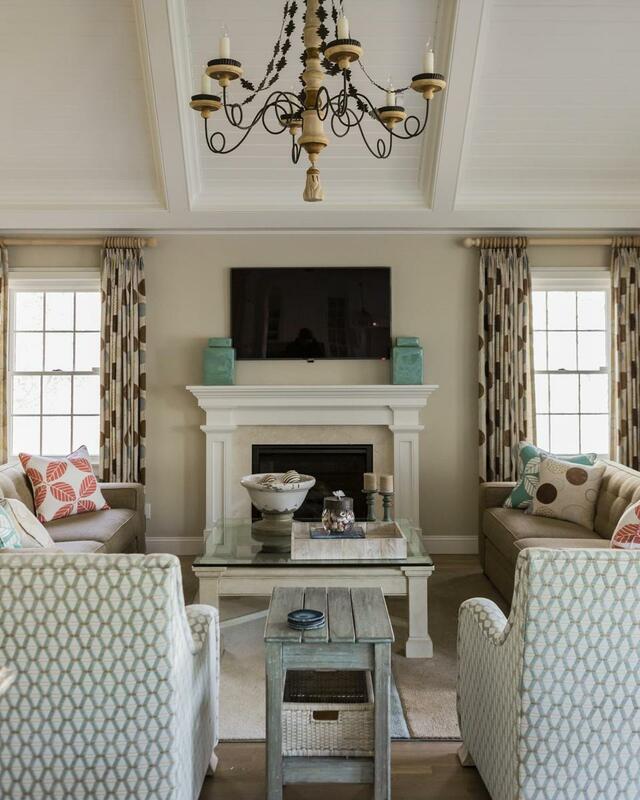 You can’t take yourself too seriously with polka dots.” Two club chairs are upholstered in a soft green and cream Kravet fabric; the tight back sofas are from Mitchell Gold. A blue and cream sisal rug is colorful and graphic while still feeling beachy. The gold chandelier is unexpected and more formal than the other chandeliers, says Donohue. There needed to be a place to stop in the tight hallway and a custom ottoman and a small table from Our House are smaller in scale.